In the years between 1950 and 2011, on average, the industry grew at a rate of nine percent and is expected to track a similar level of expansion in the future. With this proliferation, the need to effectively recycle this material and keep it out of landfills has been magnified. In fact, while plastic comprised less than one percent of municipal solid waste in 1960, by the first decade of the 2000s it had reached double figures. 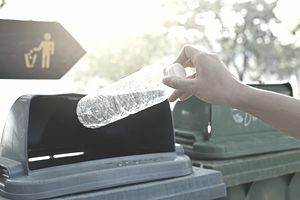 Worldwide, a range between 22 percent and 43 percent of plastic is disposed of in landfills, according to the United Nations Environmental Program. Only 9 percent of post-consumer plastic, amounting to 2.8 million tons, was recycled in the U.S. during 2012. The balance, totaling 32 million tons, was sent to landfills or otherwise discarded. Around 4 percent of annual petroleum consumption globally is used to produce plastic, with an additional 4 percent employed to power manufacturing processes for plastic production. Waste to energy is a very important approach in Europe where 36 percent of post-consumer plastic was burned to generate energy in 2012. Recycling absorbed about 26 percent of post-consumer plastic generation or 6.6 million tons. The balance, 38 percent of post-consumer plastic, ended up in landfills. Additionally, between 10 to 20 million tons of plastic end up annually in the oceans. According to a study cited by Worldwatch Institute, there are 5.25 trillion plastic particles weighing a total of 268,940 tons are currently adrift in oceans around the world. The economic impact of this situation amounts to losses of $13 billion per year created by financial losses to fisheries and tourism as well as time spent cleaning beaches. One of the challenges for sustainable recycling has been the flow of plastic material to unsophisticated recycling operations abroad, which generate pollutants and contaminate water in the course of recycling, or alternately, that instead of being recycled, such material is ending up in waste to energy plants lacking effective pollution controls. In 2012, 56 percent of worldwide plastic recovered was shipped to China, however, thanks to the 2010 Green Fence Operation, Chinese authorities are gradually reducing the number of unregulated facilities. In response to the shift to plastic, the plastic recycling industry has continued to expand as well. Plastic recyclers provide many benefits environmentally as well as to the economy. According to the Institute for Recycling Industries (ISRI), there are many environmental benefits from using recycled material versus virgin material in terms of the reduced demand for raw resources, as well as the decreased energy required for processing. In regard to diversion, recycling helps keep plastic material out of landfills. As well, the use of recycled materials is more energy efficient in terms of producing than new material, while avoiding the consumption of new resources. For example, the U.S. Environmental Protection Agency (EPA) notes that plastic recycling results in significant energy savings amounting to an estimated 50–75 MBtus per ton of recycled material versus production of new plastics using virgin materials. Progress continues to be made in the recovery rate for plastic material, as well as in the efficiency of the recycling industry. Over the last 25 years, for instance, sophisticated sorting and recycling systems have been developed to help shape the modern plastics recycling system. One example, new beverage bottle recycling plants are now capable of recycling polyethylene terephthalate(PET) bottles into food grade plastic. Additionally, researchers continue to explore how to derive more value from plastic residuals in a variety of creative approaches, stemming from waste energy to conversion of plastic to oil. In 2010, 9.2 billion tons of plastic were recycled, including 5.3 billion pounds of post-industrial scrap, and 3.7 billion pounds of post-consumer material. The U.S. exported $940 million worth of plastic scrap in 2010. Industry thought leaders recognize that a systematic approach needs to be taken when looking at this problem - embracing the entire product lifecycle. The challenge is to fully leverage the amazing attributes of plastic while creating a system that prioritizes design for recycling and more effective recovery. While the future of plastic recycling is promising, however, it still has a long way to go. A high percentage of plastic material still goes to landfills, for many reasons, including incomplete coverage of municipal curbside recycling programs, inconsistent state laws and local confusion over what is or is not recyclable, product design issues, as well as other issues.